Ribes species (Rosaceae). Hybrids of Ribes uva-crispa (in Europe) or of Ribes hirtellum (in North America), gooseberry cultivars differ according to their parentage. European gooseberries have larger fruits and the bushes are more compact but more upright than North American species. European gooseberries are derived from Ribes uva-crispa, a native of the Mediterranean, North Africa, the Caucasus and northern China. Breeding and selection over several centuries have produced hundreds of cultivars, many with improved resistance to disease. Most recently the introduction to Europe of genes from the American species Ribes divaricatum has conferred resistence to American gooseberry mildew; in North America, hybrids of Ribes hirtellum with European gooseberries are more resistant to this infection. The first record of gooseberry cultivation in England dates from 1276, but the fruit was not generally grown until the early 16th century, when gooseberries and other fruits were introduced from the Continent. Many new cultivars were raised by English and continental growers thereafter. In 1831 the collection in the Horticultural Society’s London garden comprised 360 cultivars; a nurseryman’s catalogue of 1865 listed 227. The 19th century also saw the rise of gooseberry clubs in the north of England, whose members competed to produce the heaviest fruits; a few clubs still continue today (notably at Holmes Chapel, Cheshire, and Egton, North Yorkshire). In the last century commercial growing in the UK was stimulated by the reduction of sugar duty, but early in the 20th century, the American gooseberry mildew fungus was introduced to Europe and the industry declined. Breeding programmes have aimed for new cultivars with resistance to mildew and leaf spot, and without spines. The major producers, mainly for processing, are Germany and Poland, with England, Hungary, France, Belgium and Holland growing smaller acreages. In North America, European cultivars were too susceptible to mildew to be of commercial value. The first American-raised seedling with mildew resistance was produced in 1839 by crossing a European cultivar with Ribes hirtellum, a native species. Commercial growing has not been important in North America but is having a minor revival. 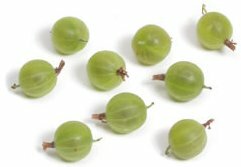 Gooseberry fruits are available from late spring (green, for cooking) until summer (ripe, for dessert). They are most successfully grown in cool, moist climates such as northern Europe, the northern US and Canada, since high temperatures and drought inhibit fruit development. Flowers and young fruits are susceptible to frost, which must be avoided. Cold winds at flowering discourage pollinating insects, so shelter from north and east winds is essential, while strong winds in summer can break soft new growths. The best soil for gooseberries is a well-drained medium loam. A fair degree of acidity is tolerated (pH 6.0-6.5), and plants may show some resistance to lime-induced chlorosis. On light soils growth is often poor, although conditions can be improved by incorporating organic matter before planting. Heavy soils encourage soft growth and excess vigour, but these may be controlled by careful manuring with sparing use of nitrogen. Gooseberries are usually grown as a bush on a 15cm stem, which keeps the fruits well above the soil and makes it easier to keep the soil around the plant clear of weed growth. Gooseberries may be grown commercially as a suckering bush or in hedge form. Restricted forms such as cordons and fans are of value where space is short, or for ornamental purposes. Rootstocks are only used for standard bushes, with Ribes divaricatum or Ribes aureum for the 1-1.25m stem. Bushes of European cultivars are planted 1.5-2m apart each way, double cordons 1m apart, and single cordons 0.5m apart. American cultivars, which are taller, are planted with up to 3m between the rows. Before planting, the soil is dug or forked over, usually to a spit deep, to clear weeds and to incorporate a good dressing of well-rotted manure (5kg/m²), more on a light soil). Two-year-old or three-year-old bushes are usually available from nurseries, but for cordons it is easier to train. Remove any suckers from the stem. Plant in the dormant season, when the soil is not frozen nor too wet and sticky. Cordons will need canes for support. Pruning the first years after planting is aimed at establishing a strong framework for later fruiting. A two-year-old or three-year-old bush will have six or eight branches radiating from the top of the stem. After planting, cut each of these branches by half, pruning any lateral shoots to one bud. For cordons cut the main stem by half and any laterals to one bud. Gooseberries also lend themselves to training as ornamental U or double-U cordons. Gooseberries will fruit on one-year-old or two-year-old shoots; annual pruning is necessary to maintain a continuous supply of new vigorous shoots. Once the plant starts to fruit, the lateral shoots are cut back to about 8cm every winter, while the leaders are pruned as before. The leaders of cultivars that tend to produce drooping growth should be cut to an upward pointing bud. Summer pruning, i.e. pruning the laterals to five buds at green harvest time, encourages spur formation, increases light penetration and air circulation within the branches, and also helps to control American gooseberry mildew by removing infected shoot tips. Summer-pruned laterals are shortened to three buds in the following winter. As the bushes age, some old branches are cut out completely to keep the centre open. The same regime applies to established cordons, whether single-stemmed or double-stemmed: each stem is treated as a branch on a bush, the leader tipped in winter and the laterals first summer-pruned to five leaves and then cut back to three buds in winter. When the cordon reaches its required height it is cutback to at most three buds each year. After some years the old spurs will need to be rejuvenated by cutting back into the older wood. Gooseberries need regular supplies of potassium and nitrogen, but little phosphate. Apply sulphate of potash at the end of the winter at 15g/m², and sulphate of ammonia in early spring at 30g/m². Magnesium deficiency may occur on light soils and is controlled by a soil application of Epsom salts (magnesium sulphate), but this must be balanced with the level of potash applied. Mulching with some form of organic material will help to control weeds, conserve soil moisture and maintain soil structure. It is important to maintain soil moisture especially in late spring, the period of greatest shoot growth and of fruit swelling. In dry spells apply water at 20 litres/m². Competing weeds must be controlled, but not by digging around the stem, which would damage the feeding roots near the soil surface. Herbicide application, shallow hoeing or mulching are satisfactory alternatives. Fruits are progressively thinned, starting from when they are about a third of their final size, and the thinnings used for cooking or freezing. This leaves room for the development of dessert fruits, which for finest flavour are picked when soft and juicy. 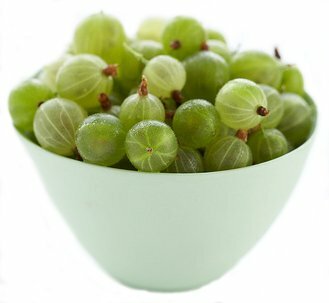 Gooseberry fruits are grouped according to skin colour (green, yellow, red, white), and are further subdivided by hairiness and shape. Propagate by hardwood cuttings or layering. For cuttings, select straight, 30-40cm shoots of the current year’s growth in autumn, just before all the leaves have fallen. Remove buds from the centre section, which will form the stem, leaving about four buds at the top and those on the bottom third. This lowest section of the cutting is inserted into a narrow trench and firmed in. Rooting of gooseberries is erratic but timing and the presence of the basal buds will encourage root production. After a year the cutting should be well rooted and ready for transplanting to its permanent position. In North America and Germany, mound layering (stooling) is used for propagating commercial quantities of gooseberry plants as it gives more reliable results. Birds are a considerable pest for gooseberry growers and will eat out buds over winter; the only certain control is to cover the bushes with netting. Caterpillars of gooseberry sawfly and magpie moth feed on the leaves and can quickly defoliate a bush; pick off the caterpillars by hand as soon as they are seen in late spring, or spray with a contact insecticide. The most serious disease is American gooseberry mildew, which infects new shoots; summer pruning helps to control the disease by removing infected shoots, but in severe cases a regular spray schedule with a preventative fungicide may be necessary. Leafspot can cause early leaf fall, and can be controlled by a preventative fungicidal spray programme. In North America gooseberries are an alternative host to white-pine blister rust and should not be grown in areas where white pine is a commercial crop. Viruses are less harmful to gooseberries than to other soft fruits, and infected plants may continue to grow and fruit for 20 years or more. Recommended cultivars: Green-white: 'Invicta' (mildew-resistant, very spiny, vigorous), 'Greenfinch' (resistant to leaf-spot), 'Jubilee' (virus-resistant, vigorous). Red: 'Captivator' (tall, thornless), 'Hinnonmaki Red' (very cold-resistant), 'Pixwell' (compact), 'Poor man', 'Whinham's Industry' ('Rote Triumph') (susceptible to mildew, good flavour, very vigorous). Yellow: 'Hinnonmaki Gold' (very cold-resistant), 'Honings Fruheste' (good flavour, very vigorous), 'Leveller' (good flavour, moderate vigour), 'Oregon Champion'. 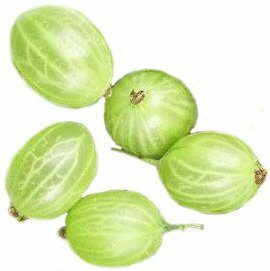 American gooseberries (smaller and less well-flavoured than European, more heat and cold tolerant, often resistant to powdery mildew): 'Captivator', 'Josselyn', 'Oregon Champion', 'Pixwell', 'Poorman', 'Welcome'.